Pandoro is a traditional Italian sweet bread similar to Panettone that you can find at most specialty stores around the holidays. It is the perfect bread for this easy and most comforting bread pudding dessert. You can enjoy it hot out of the oven or cooled and cut into squares. Spread Pandora bread pieces evenly into a generously buttered 13 x 9 x 2 baking glass dish. Scatter slivered almonds and currants on top. In a large bowl whisk the eggs. Add the heavy whipping cream, milk, sugar, vanilla, and cinnamon whisking until well blended. Pour the mixture over the bread and let it stand for 30 minutes. Press the bread cubes down so it can absorb the custard. Bake until the pudding is set and golden, about 50 minutes. Cool slightly and serve warm. 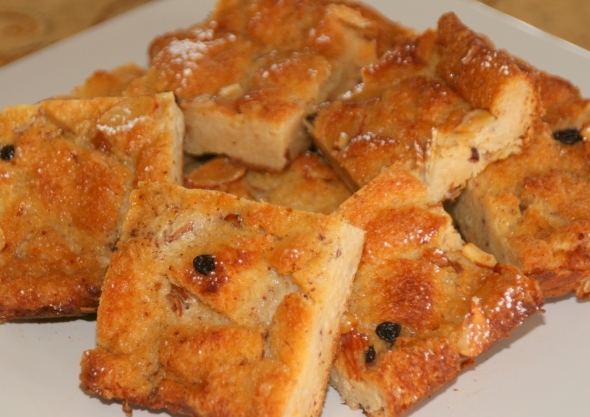 Or, to make bread pudding squares, refrigerate until cold. Carefully run a knife around the edges and gently lift onto a cutting board. Cut into 2 x 3 inch squares and serve.